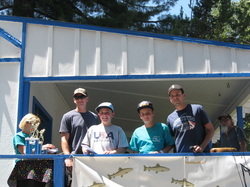 The 10th annual Fish For A Wish Trout Tournament was held at Big Cove Resort on Saturday August 9th, 2014. 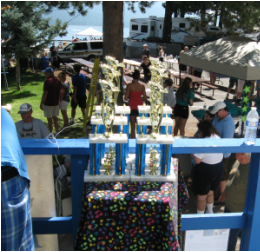 Embodying the spirit of the Make-a-Wish Foundation, the tenth annual Fish for a Wish tournament raised $65,000 to $70,000 on August 9th to grant the wishes of five terminally ill children. Anglers were up bright and early on the shores of Big Cove Resort and Marina, waiting in anticipation to cast their lines in support of making these wishes come true. 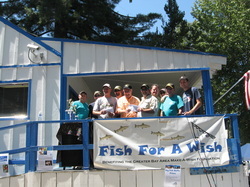 Displayed at the event was a board filled with photos of 29 children whose wishes the Fish For A Wish derby raised money to grant. Many of the children's wishes were destination based. Photos of recipients at Disneyland, LEGOLAND, Greece and Ireland were scattered on the boards. Other wishes granted included meeting Justin Bieber, riding in a NASCAR race car with Travis Pastrana, hang gliding and trying out for a Major League Baseball team. 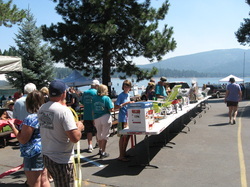 As soon as the horn blew at 6 a.m., the light of the sunrise guided dozens of boats into Lake Almanor for a day of competitive fishing. 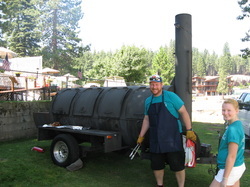 Contestants in the derby competed to land the largest bag limit of 3 trout or salmon, and the biggest brown trout, rainbow trout or salmon. 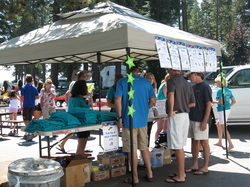 Participants were allowed to compete in teams. 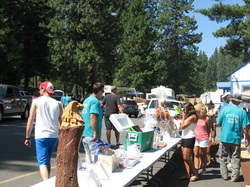 Two raffles were conducted: one included various items donated by local business and sponsors; and the other was a grand prize drawing for a 46-inch Sony LED television.